"Chocolate chip cookies as bars!" In large bowl, cream shortening, eggs and brown sugar. Add in milk and vanilla extract and mix well. Gradually add in flour, baking powder, baking soda, and salt. Mix until well blended. Fold in chocolate chips and stir until chips are evenly distributed in dough. Spread dough in pan and bake 25 to 30 minutes. Let cool before cutting into bars. 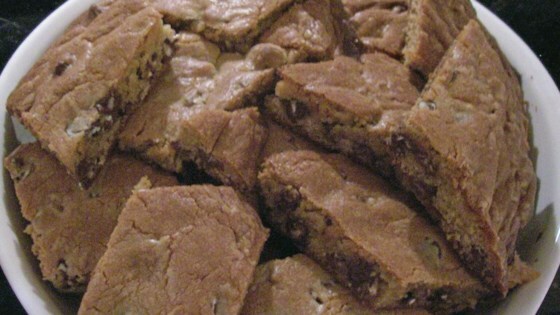 Make these delicious cookie bars instead of dozens of cookies! After swapping the shortening for butter and regular milk for soymilk, I was pleased with my results. The bars' consistency landed somewhere between cake and bar which was fine with me. This isn't a cookie at all! It's much more like a chocolate chip cake. Tastes nice, but it's cake...not cookie. We're very disappointed.